Fenton has made contemporary Butterfly and Berry items. The Fernery was redone for HOACGA (the Heart of America Carnival Glass Club) and has an interior pattern with “Good Luck” a horseshoe emblem in the center with 1984, and “HOACGA’. The tumbler mold was reused. These should be signed (an F, Fenton, F and a number). 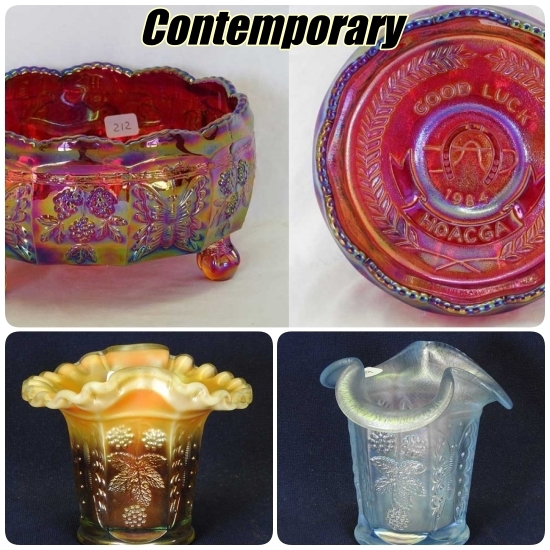 Gary Levi was a distributor who would work with different glass companies and request a certain amount of an item (i.e. Limited Editions) that would be done in colors that were not part of the original line. Some of these were marked Levay and also numbered. The Butterfly and Berry items made for Levay were from the tumbler mold and include vases and handled baskets, many were done in aqua opal.